You have to admire the balls it took for the creators of Batman: the Animated Series to make Man-Bat the first villain to appear on the show. Batman has one of the two best rogues' galleries in comics, with a lot of classic, iconic villains. Riddler, Joker, Penguin, Two-Face... basically, anybody who'd been on the TV show or in a movie. But rather than immediately fall back to any of those recognizable baddies, they went into the deep end of the pool and came up with Kirk Langstrom, a zoologist who turned himself into a bat for some reason. It does make a sort of sense: Man-Bat is, like Monkey Boy said, a Bizarro Batman, a diametric opposite take on the idea of "a guy who looks like a bat." So right way, you're setting up a contrast between the hero and the villain, and showing existing fans how obscure you're willing to go. 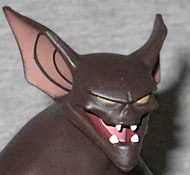 Man-Bat is a quite large figure - so big, he's not even sold in the same style of packaging as the other figures (though he still sells for the same price)! Depending on how you pose him, he reaches the 7" mark, and that's despite having crooked animal legs and a hunchback that means his neck points forward instead of up. His torso makes up about 3/5 of his total height, but it's very thin and drawn, like he was made from taffy or putty. 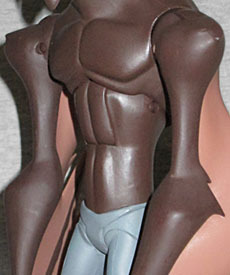 But then he's got those broad BtAS shoulders, which are exaggerated even further by tufts of hair poking off the sides. He's wearing grey pants with minimal wrinkling on them. DC Direct has once again turned to Irene Matar for an Animated sculpt, and it is once again very good. He's got huge ears with dark rings inside them, beady yellow eyes, a flat, upturned nose, and a massive mouth with two fangs on top and two fangs on the bottom. The jaw had to be done as a separate piece to get it out of the mold, so they took the opportunity to make sure his mouth and tongue were painted different colors. The figure has less articulation than the other releases in this line. 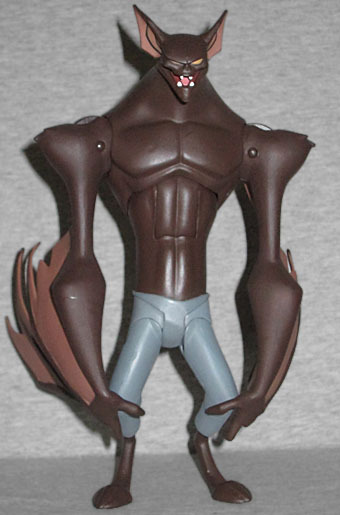 He has swivel ankles, hinged knees, H-hips, a hinged torso and swivel chest, swivel/hinge shoulders, and balljointed head. It makes sense that there are no wrists or elbows (because he has wings hanging off there that would have gotten messed up), but the knees barely flex at all, and the design of the head prevents it from looking up. They should have put a hinge joint in the base of the neck, because how the heck else is he going to see where he's flying? 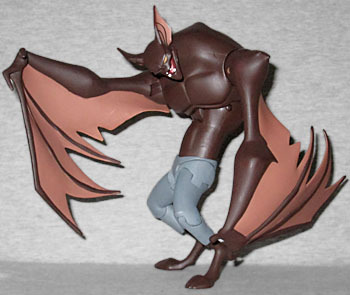 Man-Bat stands surprisingly well on his own, but just in case you want him to be a little more secure, he has one of the same stands that all the figures in this line come with. But given his massive bulk, you have to winder how well it's going to support him. After all, we're just talking about a little plastic C-clamp with hinged arms - if his big torso leans against that, it's going to open. 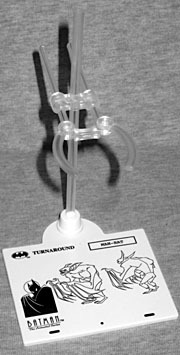 The entire arm, of course, moves up and down, and the white base is printed with a black outline turnaround of Man-Bat. It really shows how "squatty" his neutral pose should be, and that the head should be able to look up. His accessories are simple: a micro-cassette recorder and three pill bottles. The tape recorder is just a grey rectangle with painted details, but come on - pill bottles! How fun is it that any of your toys can now pretend to have a crippling pill addiction? The bottles are brown, not orange, but there's no mistaking what they're meant to be. Oh! And also! He's got extra arms! You can pull his shoulders out of their sockets, and swap between arms that have the wings folded or ones that have the wings fully extended. They swap easily, and both have the same articulation (or lack thereof). The wings have a nearly 16" span, which is impressive. It's hard to make a good Man-Bat figure. Mattel did it, but DCD's always had trouble. This one would be more fun with improved articulation, but the extra arms make him a winner.